The conclave which followed the death of Pope Benedict XIII on February 21, 1730 was among the longest ones of the century; while in the XVIIth century the Catholic powers which tried to influence the outcome of the conclave were just Spain and France, in the XVIIIth century their number grew. Pressures on the cardinals increased and opposite vetoes delayed elections. In the 1730 conclave the Medici family spent a lot of effort (and money) to ensure the election of a Florentine pope, Cardinal Lorenzo Corsini who belonged to one of the wealthiest families of the Grand Duchy. The Medici hoped that the pope would help them retain their power upon the death of Grand Duke Gian Gastone who was in poor health and did not have children. Cardinal Corsini chose to be called Pope Clement XII. Aged 78 at the time of his election and affected by eyesight problems he was soon bedridden and in 1733 he became almost totally blind: he relied on his nephew Cardinal Neri Corsini for the administration of the Papal State. The new pope had to deal with the adverse impact of the Polish Succession War, which was fought also in Italy; several armies, in particular that of Don Carlos, Duke of Parma and son of the King of Spain, crossed the Papal State with a large army: the great powers (Spain, France and Austria) eventually reached an agreement which entirely disregarded the historical rights of the Papacy: Parma, which was regarded as belonging to the Papal State, although ruled by the Farnese for centuries, was assigned to Austria as compensation for southern Italy and Sicily which became an independent kingdom assigned to Don Carlos (or to be precise Charles I of Parma, Charles VII of Naples and eventually Charles III of Spain). Austria extended its influence on the Grand Duchy of Tuscany which was assigned to Francis Stephen, Duke of Lorraine, husband of Maria Theresa, daughter of the Austrian Emperor. Anna Maria Luisa de' Medici, the elder sister of the last grand duke, agreed to this decision on the condition that the works of art the Medici had gathered in Florence would not be removed. The new ruler and his descendants upheld their commitment and this explains why Florence, unlike Mantua or Parma, retained its art collections (in 2006 the city of Florence dedicated an exhibition- external link to her). Pope Clement XII was totally ignored by the great powers and had to accept their decisions without being given any say in the matter. Pope Clement XII was a man of experience and of great personal wealth; in a matter of a few years he managed to restore the state budget by reintroducing state lotteries and by not using public revenue for his own benefit. Palazzo del Quirinale had become the usual residence of the popes, but it was located in a somewhat peripheral area; Pope Clement XII decided to relocate next to the palace Sacra Consulta, a congregation of cardinals in charge of the administration of the Papal State. Palazzo della Consulta was designed by Ferdinando Fuga, a young Florentine architect who played a major role in Roman architecture for nearly twenty years. Palazzo della Consulta housed also two corps of selected papal guards and this explains why its side entrances were decorated with very elaborate military trophies. Fuga also designed the stables opposite Palazzo della Consulta and enlarged Palazzo del Quirinale by completing Manica Lunga and adding Palazzina del Segretario della Cifra. Fuga redesigned for Cardinal Neri Corsini the palace in Trastevere where Queen Christina of Sweden lived during her stay in Rome; his early works had a Neo-Renaissance appearance and did not have the curved lines and elaborate decorations which were typical of the Roman Baroque architecture: in his religious buildings (Chiesa dell'Orazione e Morte, Chiesa del Bambin Gesù and the restoration of S. Cecilia) Fuga showed a greater adherence to the Roman environment. The XVIth and XVIIth centuries were both marked by a great influence of religion over political and social developments. The contrasts among the various Christian doctrines and between Christendom and the Muslim world were fierce; all parties however believed in the existence of God. In the early XVIIIth century this presupposition started to be challenged by an élite group of thinkers and in general by the members of the upper classes. In 1738 Pope Clement XII condemned freemasonry and those who supported similar views; notwithstanding the papal opposition many Catholic sovereigns availed themselves of advisors who advocated the supremacy of the State and were determined to reduce the role of the Church and in particular of the Jesuit Order in their countries. Pope Clement XII had a more lenient approach towards the other Christian beliefs; most likely during his pontificate the Protestants living in Rome were allowed to bury their dead in a cemetery near Porta S. Paolo. Members of this community were dealers in antiques or artists or were otherwise involved in trades associated with the growing numbers of foreigners who visited Rome to complete their education (the so-called grand tour). 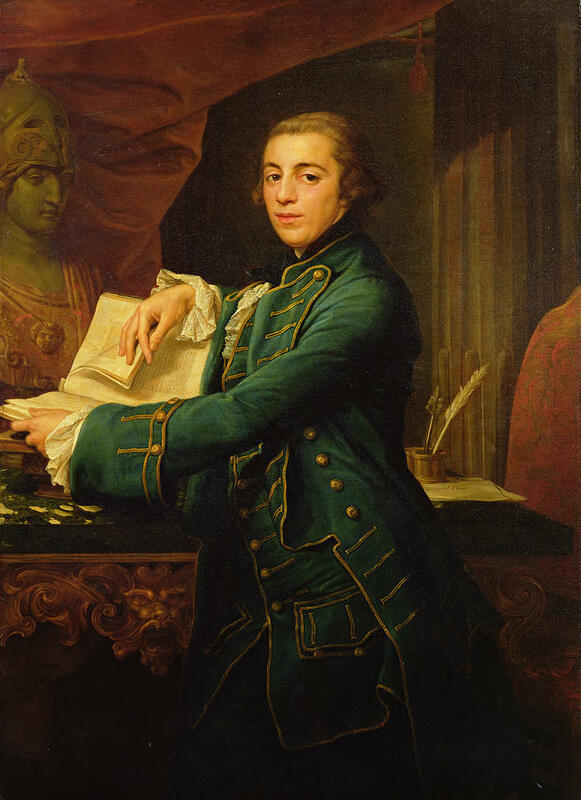 Charles de Brosses, President of the Bourgogne Parliament and fond of the works of Sallustius, a Roman historian, travelled through Italy between 1739 and 1740. His itinerary can be regarded as typical of a gentleman's Italian grand tour: his journey started in Avignon, which he regarded as a foreign town; he then moved into Italy, spending some time in Genoa, Milan (with an excursion to Lago Maggiore), Venice, Bologna, Florence and Siena. He then reached Naples without stopping in Rome: he was attracted there by Herculaneum, a Roman town discovered in 1738 under a mixture of ashes and lava which buried it in 79 AD. He completed his archaeological tour by climbing Mount Vesuvius, the nearby volcano from which lava and ashes were erupted. He then returned to Rome where he spent several months: he paid his respects to the pope and to the King of England (the Old Pretender); he met with several cardinals and visited the art collections of the great families. He was in Rome at the time of the death of Pope Clement XII in February 1740 and he wrote extensively about the following conclave, giving his opinion on the various candidates. The account of his stay provides a very interesting insight into the Roman society of the time. (March 26, 1740): The English are numberless....And, then French and Germans I could fling into the bargain by dozens. (April 16, 1740): It appears to me as odd to write to you of St. Peter's, as it would do to you to write of Westminster Abbey. Besides, as one looks at churches, etc. with a book of travels in one's hand, and sees every thing particularized there, it would appear transcribing, to write upon the same subjects. I am very glad that I see Rome while it yet exists: before a great number of years are elapsed, I question whether it will be worth seeing. Between the ignorance and poverty of the present Romans, every thing is neglected and falling to decay; the villas are entirely out of repair, and the palaces so ill kept, that half the pictures are spoiled by damp. (April 23, 1740): The conclave is far from enlivening us; ...Cardinal Delei, the object of the Corsini faction, is dying; the hot weather will probably despatch half a dozen more. (June 14, 1740): (from Naples) One hates writing descriptions that are to be found in every book of travels; but we have seen something to-day that I am sure you never read of, and perhaps never heard of. Have you ever heard of a subterraneous town? a whole Roman town, with all its edifices, remaining under ground? Don't fancy the inhabitants buried it there to save it from the Goths: they were buried with it themselves; which is a caution we are not told that they ever took. You remember in Titus's time there were several cities destroyed by an eruption of Vesuvius, attended with an earthquake. Well, this was one of them, not very considerable, and then called Herculaneum. Above it has since been built Portici, about three miles from Naples, where the King has a villa. This under-ground city is perhaps one of the noblest curiosities that ever has been discovered. It was found out by chance, about a year and half ago. They began digging, they found statues; they dug, further, they found more. Since that they have made a very considerable progress, and find continually. Pope Innocent X for the 1650 Jubilee extensively restored and modified S. Giovanni in Laterano, but he left unchanged the façade. Pope Clement XII organized a competition to complete the modernization of the old basilica. The winner was a Florentine architect, not Ferdinando Fuga, but Alessandro Galilei whose classicising bent and Neo-Palladian style won him the admiration of the commission. However he had to accept placing gigantic statues at the top of the façade to be consistent with the prevailing Roman practice (see a page on the Roman statues close to Heaven). Galilei also designed a more conventional façade for S. Giovanni dei Fiorentini. While Galilei and Fuga introduced in Rome a more classical design by some of their works, other architects continued to follow Baroque patterns. Gabriele Valvassori was the Pamphilj family architect and he redesigned the façade and the courtyard of their palace in Via del Corso; he also made some changes to Villa del Bel Respiro and to Villa Aldobrandini in Frascati. Nicola Michetti redesigned the façade of Palazzo Colonna. Giuseppe Sardi designed S. Pasquale di Baylonne and S. Maria Maddalena; Antoine Derizet SS. Nome di Maria; Carlo de Dominicis SS. Celso e Giuliano. Pope Clement XII enlarged the collection of ancient statues in the Capitoline Museums which were for the first time opened to the public. He also promoted the restoration of Arco di Costantino and paved many streets and piazzas of Rome with small square porphyry stones, which are known as sanpietrini. See a page on where one can find his coats of arms. President de Brosses sent home a letter with his comments on the conclave which followed the death of Pope Clement XII: according to him the two cardinal Albani, nephews of Pope Clement XI and Cardinal Neri Corsini, nephew of the deceased pope were leading two parties which, although unable to ensure the election of their own candidate, managed to prevent that of the other party. The conclave lasted six months; two cardinals died and several others fell sick: eventually an agreement was reached on Cardinal Prospero Lambertini who was unanimously elected. The Romans were happy about the outcome of the conclave because Cardinal Lambertini was known for his jovial character, his outspoken language and his moral behaviour. Pasquino for once did not criticize the new pope who chose to be called Benedict XIV. Ecco il papa che a Roma si conviene. e sa pigliare il mondo come viene. Here is the pope who suits Rome. and he accepts the world as it is. he teaches the world by his writings, he embellishes it by his virtues. Pope Benedict XIV had soon to face a difficult situation because a few months after his election a new war broke out. At the beginning it seemed a conflict limited to Austria and Prussia, but the intervention of France, Great Britain, Spain, Sweden and Russia led to a general European War. The issue at stake was related to the succession rights of Maria Theresa of Austria to some of her father's possessions. The pope made every effort to keep the Church outside the conflict, but the intervention of King Charles VII of Naples brought the war to the gates of Rome; in August 1744 at Velletri, the Neapolitan army defeated an Austrian one: the war went on for months and the Roman Campagna was repeatedly pillaged by the two armies. On November 3, King Charles placed his camp outside Porta Pia and the pope could not avoid receiving him in the Vatican; the king's entrance was portrayed in 1747 in one of his first etchings by Giuseppe Vasi, a young Sicilian architect, who, because of the lack of commissions, decided to start a career as an engraver. Pope Clement XII in 1732 decided to move ahead with a plan to build a monumental fountain to replace the simple basin at the end of Acqua Vergine, an ancient Roman aqueduct restored by the popes. Both Gian Lorenzo Bernini and Carlo Fontana made proposals to the popes of their time. Pope Benedict XIII approved a project which suggested placing a statue of the Virgin Mary between those of two women portraying the source of the aqueduct and Rome. Pope Clement XII thought that combining religious and pagan symbols was not appropriate and called for new ideas. Projects were submitted by sixteen architects: the winner was Nicola Salvi, notwithstanding the fact he did not have major previous works to his credit. The completion of Fontana di Trevi, as the Romans called the fountain, rather than Mostra dell'Acqua Vergine, required almost thirty years: Salvi had to coordinate the activity of several sculptors and he had to fight to ensure the statues complied with the original design of his project. While the architecture of the fountain, based on a gigantic triumphal arch, shows a classical structure, the rocks, the statues and the spouts are regarded as the swansong of Roman Baroque sculpture. The image used as background for this page shows the untamed sea horse. Pope Benedict XIV tried to reach a modus vivendi (an arrangement allowing conflicting views to coexist peacefully) with both the Catholic and the Protestant countries. He signed concordats (treaties defining the relations between the Roman Church and a secular government) with Sardinia, Naples, Spain and Portugal. He reached agreements with Austria on several open issues. He reduced the number of religious holidays from 36 to a more reasonable number, he issued simpler rules for mixed marriages, he invited Congregazione dell'Indice (the congregation in charge of allowing the printing of a book) to a more open approach and he rehabilitated Galileo. He acted very much as a spiritual leader but was criticized, in particular by the Jesuits, for his conciliatory approach. He belonged to a minor noble family from Bologna, but he did not appoint his relatives to important positions and there is not a Palazzo Lambertini in Rome. Horace Walpole wrote of him:"He restored the lustre of the Tiara/by those arts alone/by which He attained it,/his Virtues./Beloved by Papists/esteemed by Protestants:/a priest without insolence or interest;/a Prince without favourites,/a Pope without nepotism;/an Author without vanity;/in short a Man/whom neither Wit nor Power/could spoil". The Austrian Succession War ended in 1748 and already in 1754 a new war broke out which according to Sir Winston Churchill was the first world war as it was fought around the globe; it is known as the Seven Years' War: Pope Benedict XIV vainly called for an end to the conflict. In Italy Austria retained its overall supremacy: Empress Maria Theresa strengthened it by marrying her daughter Maria Amalia to the Duke of Parma, her daughter Maria Carolina to the King of Naples and her son Ferdinand to Maria Beatrice d'Este, heiress of the Duchy of Modena. Pope Benedict XIV continued to rely on Ferdinando Fuga for some of the main projects he had in mind for the forthcoming 1750 Jubilee: the most important one was related to the new façade of S. Maria Maggiore. Other works by Fuga were the gigantic apse of Triclinio Leoniano, S. Apollinare, the Coffee House in the Quirinale gardens, an enlargement of Spedale di S. Spirito and the nearby cemetery. The pope greatly modified S. Croce in Gerusalemme which was the last large church to be given a very Baroque appearance (although it shows that the pope was not prepared to spend a fortune for embellishing the church): SS. Pietro e Marcellino and S. Isidoro in Thermis were other churches built during his pontificate. Pope Benedict XIV was also very interested in practical aspects of everyday life: the streets of Rome did not have an official name and also the borders of the rioni were not clearly marked: in 1743 these were fixed and the traditional names of the streets were recorded: in 1748 Giovan Battista Nolli engraved a map of Rome which gave a very detailed record of Rome during the pontificate of Pope Benedict IV. The pope tried to improve the cleanliness of the streets and the warning inscriptions he placed in many parts of Rome show how hard he tried to modify the habits of the Romans. In order to protect Colosseo from vandalism he controlled the access to it and dedicated it to the Christian martyrs who died in the arena. The conclave which followed the death of Pope Benedict XIV in May 1758 saw the great powers all agree that the new pope should not restore the authority of the Jesuits, which many cardinals felt had been too much reduced during the last pontificate. France in particular vetoed many candidates who seemed too close to that order. Eventually the choice of the cardinals fell on the Venetian Cardinal Carlo Rezzonico, who had spent the last 15 years as Bishop of Padua and had not been involved in politics. He chose to be called Pope Clement XIII. His inexperience in dealing with major issues led him to a confrontation with many European nations which resulted in the Jesuits being expelled from Portugal, France, Spain and Naples. Eventually, in 1768, even from Parma. The pope, who had not reacted until that point in time, then threatened the duke with excommunication; France and Naples supported the duke and occupied the papal possessions inside their countries (Avignon and Benevento) and formally asked the pope to dissolve the order. Even Austria, where the Jesuits played a great role in supporting the emperors, was rather lukewarm in helping the pope. Pope Clement XIII reintroduced nepotism by appointing to the position of cardinal one of his nephews and by giving important positions to his brother and other relatives. Pope Clement XIII had to deal with a pestilence which lasted two years (1763-64) and this explains why his coat of arms can be found on a granary at Montalto and on a warehouse for the storage of olive oil in Rome. In artistic matters he is mainly remembered for having asked Johann Joachim Winckelmann to place bronze fig leaves on the naked ancient statues of the papal collections. Winckelmann, whose works on Greek and Roman art had a major role in the development of Neoclassic aesthetics, was appointed curator of these collections. In addition to the completion of Villa Albani very little was built during this period with the only remarkable exception of two works (Piazza dei Cavalieri di Malta and S. Maria del Priorato) by Giovan Battista Piranesi, a Venetian engraver whose etchings were greatly appreciated throughout Europe. Winckelmann praised the ceiling painted by Raphael Mengs in S. Eusebio, but today that view is no longer widely supported. In the depressed economic and artistic environment which characterized Rome in the second half of the XVIIIth century, painters mainly worked for grand tour travellers to whom they sold portraits which showed them on a background of Roman ruins or while admiring some ancient statues. 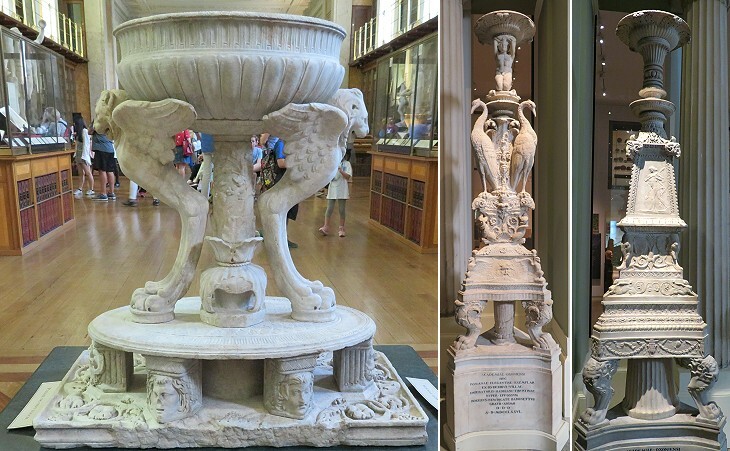 A market of fake antiquities flourished. Grand tour travellers used to meet at Piazza di Spagna and Caffè Greco was one of their favourite cafés. Walpole made reference in his letters to the first travel guides. Georges Seroux d'Agincourt, a French archaeologist who settled in Rome during the last part of the XVIIIth century was often asked by grand tour travellers about itineraries to see the city: he used to say: I have an itinerary lasting four hours for those who cannot stay longer: it is particularly suited to English gentlemen, some of whom are proud to say they have seen Rome in this period of time. I have another itinerary in one day for those who are not in such a hurry; a third one lasting one week and a fourth one a fortnight and also itineraries for one month, one year and three years; I have also prepared an itinerary lasting 35 years and this is for my usage. Pope Clement XIII announced that he would make a decision on the fate of the Jesuit order at the end of a special concistoro (a meeting with the cardinals) which was to take place on February 3, 1769, but the stress was such that he died of a heart attack the day before. The conclave which followed his death was all about the Jesuit issue. In March Joseph, the eldest son of Empress Maria Theresa, came to Rome accompanied by his brother Leopold who was the Grand Duke of Tuscany; the two spent some time visiting Rome and its environs, but the purpose of their journey was to influence the outcome of the conclave: they met with the cardinals and told them that their mother would not adversely react if they decided to disband the Jesuit order. The cardinals eventually elected Cardinal Giovanni Vincenzo Ganganelli who had held important positions in the Franciscan order and who (according to his detractors) committed himself to disbanding the Jesuits in order to be elected. He chose to be called Pope Clement XIV. He dissolved the Jesuit order in 1773 after having issued a series of decrees which laid the ground for the final decision. The leader of the Jesuits was imprisoned in Castel Sant'Angelo, where he died two years later. If there had been opinion polls in the XVIIIth century, Pope Clement XIV would have scored very badly; but regardless of his personal merits it was the role of the Church which was challenged by the European upper classes. Baroque art was viewed as being strictly associated with what seemed just a relic of the past and in a matter of few years its works of art (in particular its architecture and sculpture) were regarded with disdain if not revulsion. 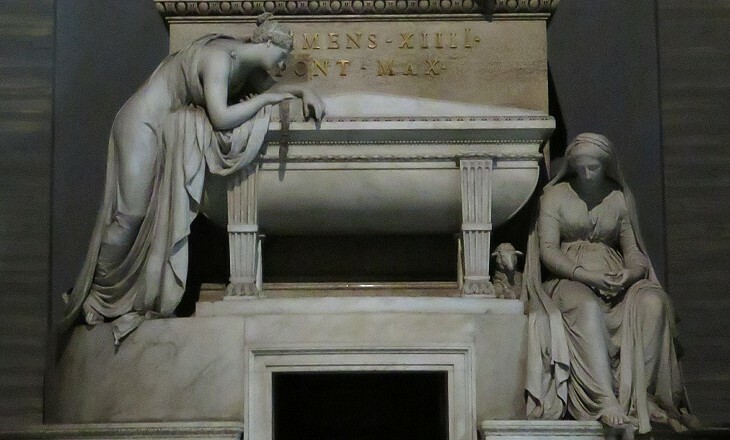 The main contribution of Pope Clement XIV to art history, besides a few fountains and the enlargement and modernization of the Vatican collections, lies in the monument designed by Antonio Canova to celebrate him. It was commissioned by a friend of the pope in 1781 and Canova completed it in the following year; it was immediately regarded as a masterpiece and the translation into marble of Neoclassic aesthetics. Bernini's wind no longer blew over the clothes of the composed figures designed by Canova. 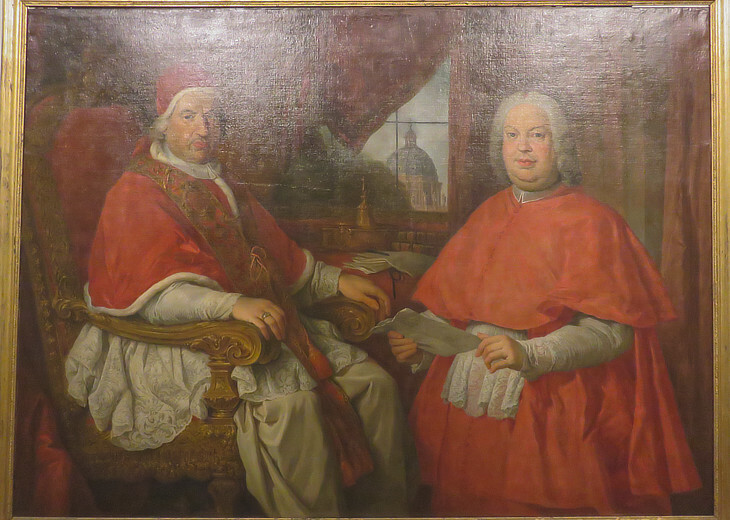 Pope Benedict XIV and Cardinal Silvio Valenti Gonzaga by Pierre Subleyras (1699-1749) - Museo di Roma - Rome. 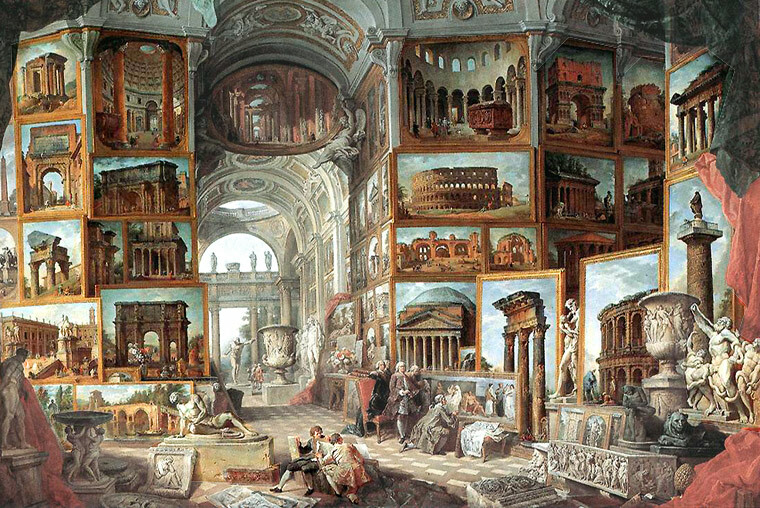 Ancient Rome by Giovanni Paolo Pannini (1755) - Staatsgalerie - Stuttgart. 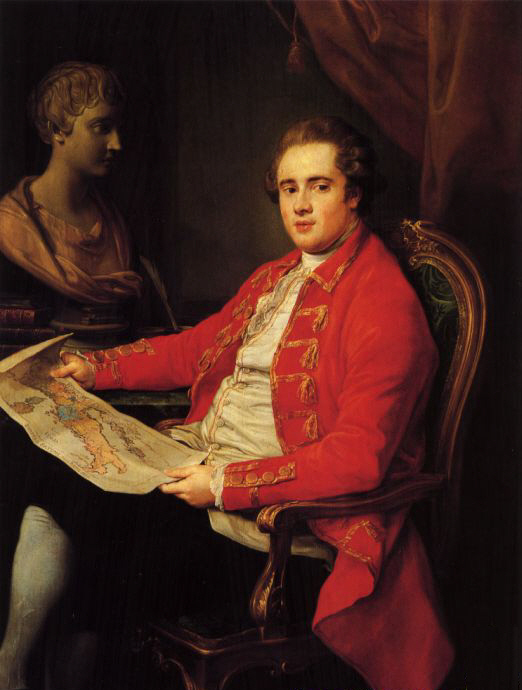 Portrait of John Crewe by Pompeo Batoni (1760) - Private Collection. 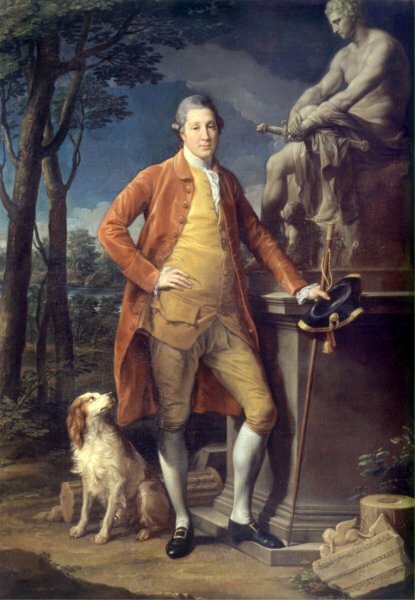 Portrait of John Staples by Pompeo Batoni (1773) - Museo di Roma - Rome. Portrait of Sir William Hamilton by Pompeo Batoni (1708-77) - El Prado - Madrid. 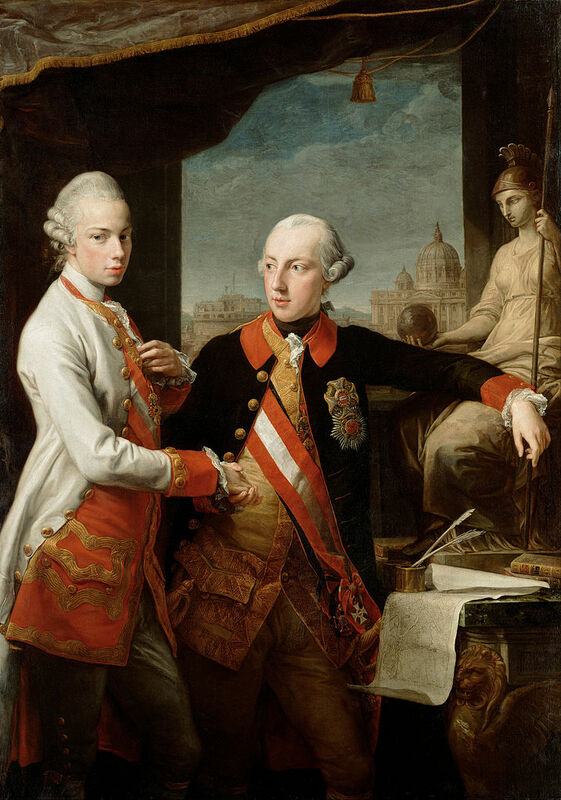 Emperor Joseph II and his brother Leopold by Pompeo Batoni (1769) - Kunstorisches Museum - Vienna.